The Fangirl Experience is a monthly column suggested by Jaime Heller, featuring contributions from both our staff and our readers. Everybody has those moments when being a fangirl feels like the world has become perfectly balanced. It's those moments when you feel a stir in your heart that maybe you've made the right decision in falling down the fandom vortex. When, in the words of my good "friend" Zachary Levi, your "unbridled passion for something, or things, defines who they are as a person without fear of other people's judgment." It's that moment you want to share with the whole world, scream to the rooftops, about what happened. Maybe it's a small moment, maybe it's a big one. But every fangirl has one--or will have one--and we would like to share ours with you. Because our Initiative would be nothing without the Experience. I’ve loved fairy tales for as long as I can remember. At age seven, I was hanging off my deck to better serenade the birds, thinking somehow that if I sang "Once Upon a Dream", the forest critters would somehow understand me and flock to my aid. As I grew older, I became fascinated with the true fairy tales and fables: the gruesome Grimm tales, the beloved Hans Christian Anderson stories, the colorful Andrew Lang collection. If ever something could compete with that burning passionate fangirly adoration, it would be Sailor Moon. She was a beacon of hope for all strong, independent young girls everywhere. To think, the man doesn't have to be the one saving you. Rather, you and all your closest gal pals could be the true heroes! Thus, I come to The Lunar Chronicles. Ah! Where shall I begin? I remember waiting too long (in my opinion) to actually read them. I heard they were good, finally read them and then realized, huh, this sounds kind of like a combination between fairy tales AND Sailor Moon. Low and behold, the author is a huge fan of both. And guess what! I was able to meet her. THE Marissa Meyer. Okay, okay. Getting ahead of myself. I had the honor to embark on this fabulous journey with none other than Jaime Heller. Mhmm, the one that writes for this blog. After warning her that we'd get lost about 1,328 times (which we did, just about) and gushing about how badly I had wanted to meet Marissa (Jaime felt the same), we finally made it to Cincinnati, which apparently is one of Marissa Meyer's favorite stops on book tours. Anyway, we got there. 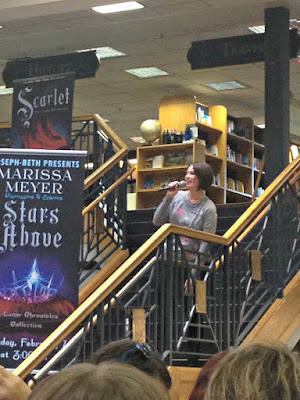 As we stepped through the bookstore's threshold, we could smell the newly printed books, “see” The Lunar Chronicles banners blowing in the nonexistent wind, and hear the cheers of hundreds of Marissa Meyer fans. If you're wondering, she did not disappoint. 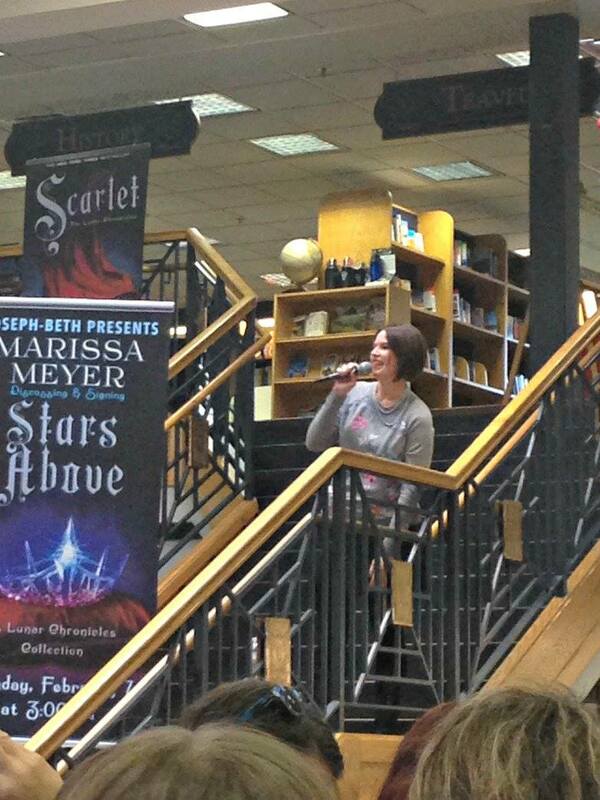 She greeted her fans with flare then proceeded to tell us the story of The Little Mermaid. Nope, not Disney's The Little Mermaid, Hans Christian Andersen's The Little Mermaid. You know, the one where the mermaid turns to sea-foam at the end. Yup, it does NOT have a happy ending. I couldn't believe that not only would I be (in just a few moments) meeting Marissa, but that she would be telling us the original tale of The Little Mermaid in classic storyteller fashion. I nearly cried, both from the tale's tragic ending and from my own Ican’tbelievethisisactuallyhappeningtome freakout. After said events happened, everyone fell into position. We waited a long time...a LONG TIME. But my, was it worth it. Before you actually met her, Marissa's publicist had set up a white board with the various Lunar Chronicles’ characters' names. You could vote for your favorite female and favorite male character! I, of course, voted for Cress and Thorne because...they're CRESS AND THORNE! I just had to tell Marissa that I appreciated her loving two of my favorite things in the world: fairy tales and Sailor Moon. She immediately held up her hand for a high five! GAH, it was way too exciting. I think my heart exploded, and I had to magically regrow another one. But yes, all that waiting was worth it. And the journey to get there was just as worthwhile. Once Upon A Time... I stumbled across a book series that I've been trying to convince other people to read ever since. I'm not sure when I first picked up The Lunar Chronicles, but I know it was well before the final book came out, and I had to wait an agonizing year and a half to read the conclusion. But when I read the first book, Cinder, I was immediately hooked by the concept. It was Star Wars meets fairy tales meets Terminator. How could I resist such an idea? Yet, it was so much bigger than just another book series. It. Was. Amazing. I was so mad I hadn't thought of writing these books first! Cinder swept me away into a space opera fantasy with cyborgs, androids, and a deadly virus. It was a combination of pretty much everything I love (except dragons). I was so sad to say goodbye to these characters, which had become friends, when the final book, Winter, came out in November of 2015. But it wasn't the end. They announced a collection of short stories about the characters with the most gorgeous title: Stars Above. I was so psyched to read more. But then there was even better news: Marissa Meyer would be going on tour yet again for this book! 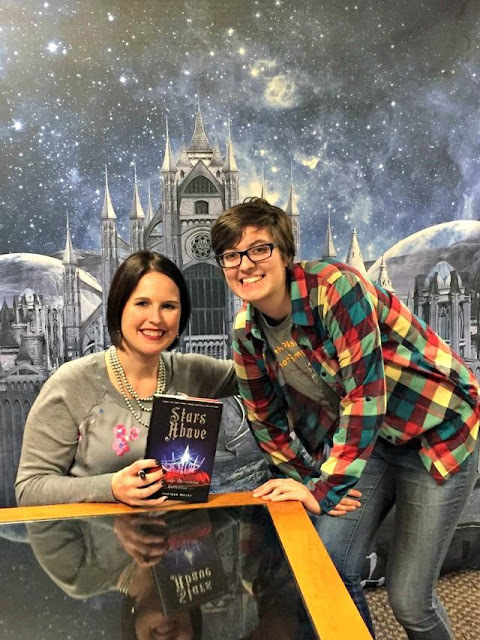 I'd apparently missed her other book tours, lost in the stars of The Lunar Chronicles instead. But I didn't get my hopes up. Living in the middle of nowhere Ohio means authors never seem to visit for book tours. Not even to bigger, nearby cities like Cleveland or Columbus. I'd only met a few small authors, who I barely knew myself, due to school events. I'd never dreamed I'd be able to meet any of my favorite authors--especially those with best-selling books--without traveling far distances and spending lots of money. 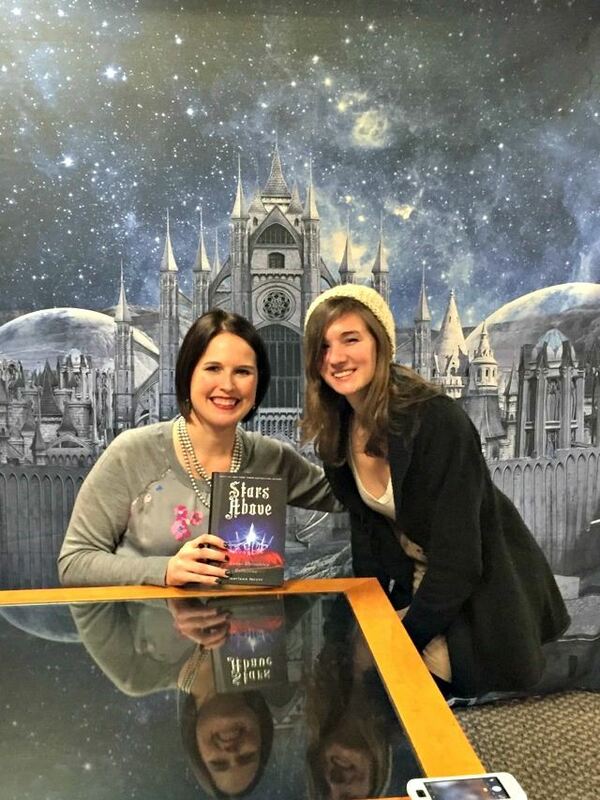 Until the Stars Above book tour schedule was released. 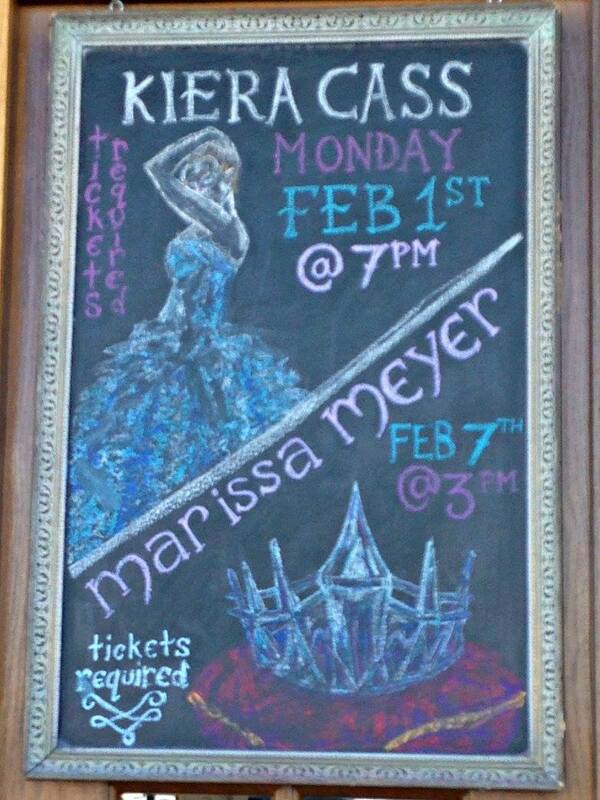 Marissa Meyer would be in Cincinnati, OH, on a weekend day. Not only was this a doable trip for a weekend, but my sister happens to live only about an hour from the bookstore. This would be perfect! We got to the bookstore (extra early, just in case) somewhat successfully and managed to maneuver into a parking spot. 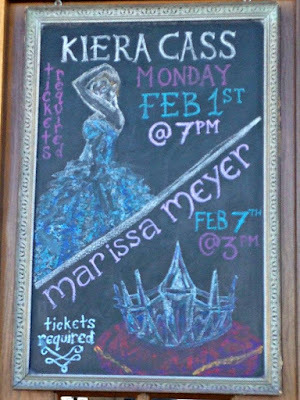 Outside the bookstore, there was a chalkboard sign to announce upcoming events. 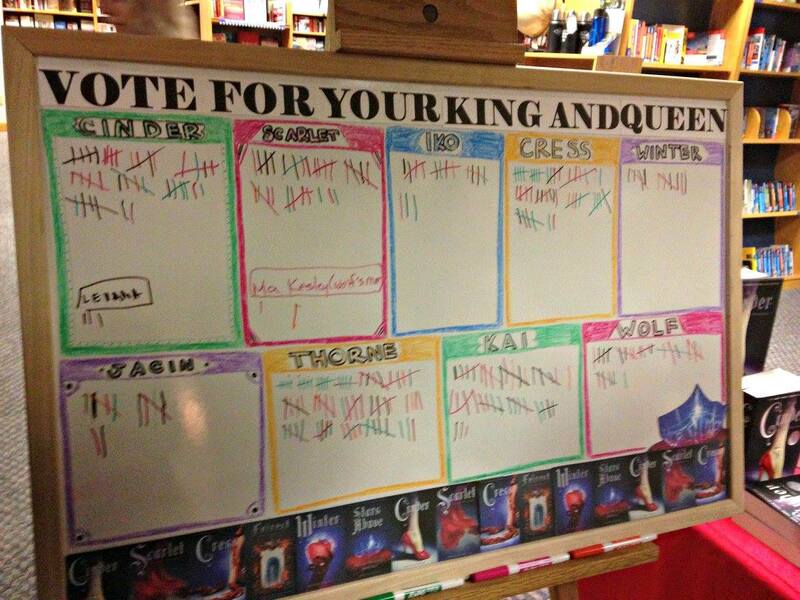 Apparently, the bookstore was celebrating YA Week, and they'd had other authors visit previously. But someone had drawn the book cover of Stars Above on the chalkboard, which was marvelous! Seriously, though, these are so cool. We entered the bookstores and could hardly contain our excitement for the next hour or so. As part of the event, we had to pre-order the book in order to get a pass into the signing line. I was perfectly fine with buying the book with its wonderful hardcover format and beautiful cover. I had already read it because I didn't want to wait! So we went and got our books, clutching them tightly to our chests as if that would help us contain ourselves. 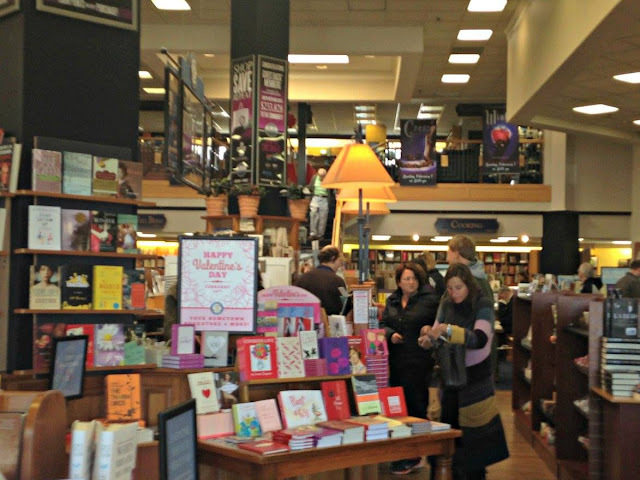 Then, we were left to explore the entire bookstore. 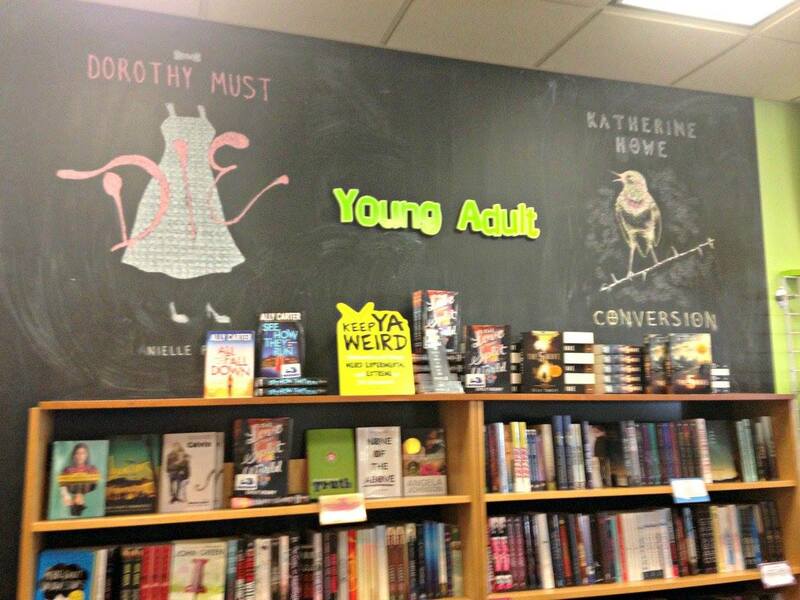 Like Kelly mentioned, the YA section was super cool with more chalk-drawn book covers. 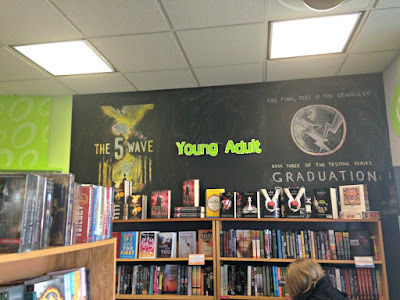 They had a nice selection throughout the store, which opened up the opportunity for us to recommend must-read books to each other. We even helped a few other people choose books to read. There were plenty of books I longed to buy but realized my wallet was a bit on the empty side (especially if I wanted to eat dinner after the event). This was the YA section. Pretty neat! She told us the true story of The Little Mermaid, which was delightful to experience. I realized I hadn't heard the original story in full before. Sure, I knew the ending, but I hadn't actually heard it. Then, the signing line began. We had to wait a while, but it just gave us the opportunity to talk to other people and to discuss books! What better thing is there to do while in a bookstore? These were the fanart submissions. Each one was beautiful and unique! Finally, our section was called, and we got in line. We waited, looking at more books. We got to the staircase, which led up to the signing table, and my heart was thrumming louder than the starship Rampion. The favorite character poll was super cool, especially the various names people had added in addition to the normal cast. (I added one myself, Winter's wolf friend, Ryu.) Then, it was our turn to go to the signing table. Kelly went first, which was adorable as she mentioned. I was so nervous when I walked over to the table. Marissa said hi, I don't remember what I did or said in response. She signed the book. The whole time was thinking "What should I say? What should I say?" My brain had suddenly gone completely blank. I couldn't think of anything to say! Then, we were taking a picture. (With the coolest background ever! I wished I could take it home and hang it in my room.) And it was over. In the flurry of nerves and brain hiccups, I had forgotten to grab a free Lunar Chronicles swag! (I'm still angry with myself.) We walked back down the steps; my whole body felt like jelly, and I thought I was shaking. But I felt so... dumb. I hadn't said anything intelligent or cool to Marissa. I didn't get to mention how much I loved Thorne or to ask if she meant to reference some of the other fairy tales that weren't one of the four main retellings. Instead, I'd just awkwardly stood there and watched through blurred eyes as she signed the book, and I'd taken a picture with someone I hadn't even said anything to! Oh, the woes of being a fangirl. Still, the whole trip, the whole experience was fun and exciting. I can openly scream to the world that Marissa Meyer touched me! (I've got photographic proof too.) I can show off my signed book and tell people that I heard her speak. It was definitely a day to remember, an opportunity I hadn't had the chance to experience before. 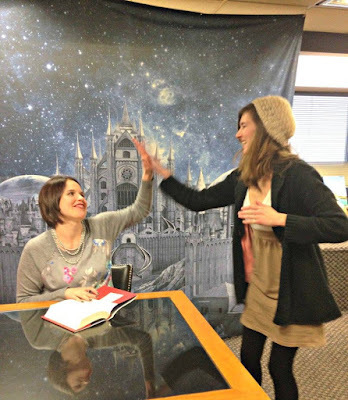 Plus, Marissa Meyer was pretty darn cool and laid-back. Despite my failing to say anything or my nervousness making me feel like the whole thing went by in a blur of books, chatter, and escalated emotions, I think at the end of the day... it was a happily ever after. Have you ever had an out-of-this-world fangirl experience? The Fangirl Initiative wouldn't be complete without the help of you, our readers. We want to hear and feature your stories and tales. 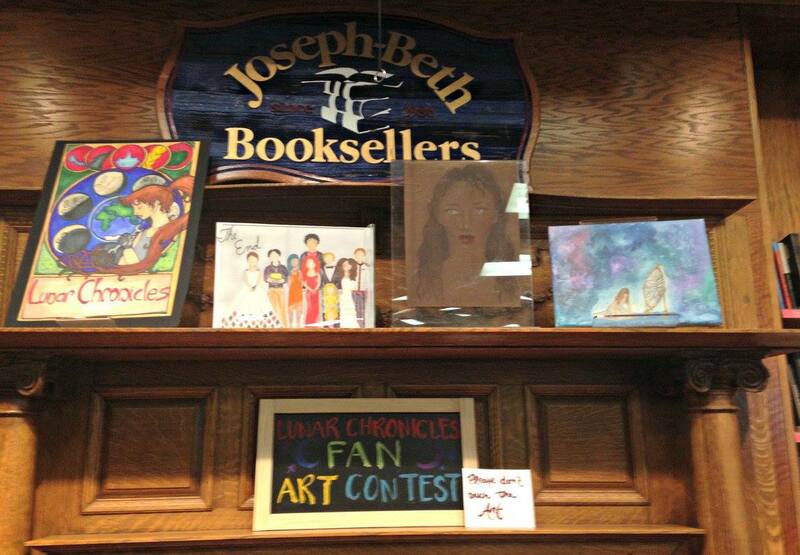 If you have a fangirl experience you'd like to share in this column, let us know! For more of the Experience, check out our Instagram for daily Fangirl Experiences. All photos were taken by Kelly Chaplin.